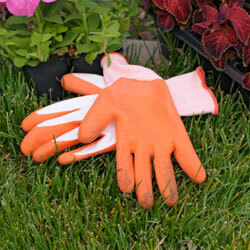 Many gardeners believe garden gloves are easy to do without. Those of us who love gardening enjoy the feel of soil running through our fingers, and we don’t mind the line of dirt under our fingernails. We prefer to not have anything impede the dexterity needed to sow small seeds or pinch a plant, and we like the textures of the plants we cultivate. We would rather spend our budgeted gardening dollars on the latest herbaceous sensation rather than unnecessary gloves, and, frankly, nobody likes sweaty hands. Improving your grip on tools, minimizing accidental drops that can damage expensive tools. Keeping hands warm in cold weather so we can garden in comfort even in early spring or late fall. Keeping hands dry in wet weather to prevent skin irritation and problems that could limit our gardening. Preventing contact with animal waste that may carry bacteria, mites or other pests that could harbor diseases. Helping avert calluses and blisters that can make even simple gardening tasks painful and unpleasant. Protecting hands from cuts, splinters and thorn pricks from aggressive plants so we aren’t limited in our gardening choices. Preventing contact with poisonous plant oils that cause rashes and allergic dermatitis. Keeping nails clean and help prevent nail breakage so our hands can be as beautiful as our garden. Protecting from soil borne fungal and bacterial infections that could be spread around the garden easily. With so many great reasons to use garden gloves, which ones should you choose? With so many gloves on the market there’s a style available for every garden chore, season, weather condition, hand size and preference. Check out our selection today. We are happy to help you choose a pair or two that work best for you and your gardening needs.